UPDATED Today’s the big day for Tesla and its planned IPO, which will debut on the Nasdaq under the symbol TSLA, and could be the largest IPO for a U.S. car company since Ford Motor’s (s f) initial public offering more than half a century ago. And quite aggressively, Tesla has priced its IPO at $17 per share, above the previously expected range of $14-$16. At $17 per share, Tesla raises $226 million. At $17 per share, Tesla’s executive directors and officers, and investors will also stand to make a whole lot of money (see our post on Who Wins in the Tesla IPO). If the stock sustains itself over the long haul, Tesla’s performance could deliver something more lasting: a signal about the degree of public confidence in electric vehicles at this early stage of the market, and the role that IPOs will play in financing next-gen cars (check out What Tesla’s IPO Means for the Green Car Biz). The stock will “be looked at as a bellwether,” is how Lux Research analyst Jacob Grose put it to us, given the company’s status as “by far the highest-profile electric vehicle startup.” We’ll be monitoring the stock throughout the day to see how it fares. Tesla and its bankers have been highly aggressive and seem to be confident in the stock. Yesterday Tesla upped the ante on its IPO, planning to sell 20 percent more shares than previously expected. One reason for the bullishness on Tesla is that it recently announced a deal with Toyota (s tm), which agreed to buy a $50 million stake in Tesla at the IPO share price immediately following the IPO. 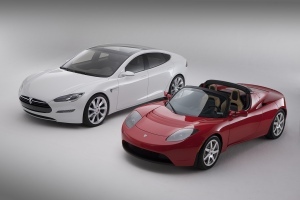 Yet ties between the two companies remain very limited at this point, and Tesla has a long road ahead to start cranking out the Model S in large numbers, the key for Tesla to reach profitability. All of this is despite the fact that Tesla won’t be making any profits anytime soon. Net losses for the company grew to $29.52 million in the first three months of 2010, up from $16.02 million in the year-earlier period. Update: Tesla’s shares opened this morning at $19 apiece in their public trading debut, above the $17 per share offer price. Will Tesla See a Powerhouse IPO? The CEO and senior staff lied to the City of San Jose about building their car factory there and those communications are actionable. The CEO and senior staff lied to multiple other cities about building their car factory there and those communications are actionable. The CEO cheated on his wife with escorts while married. The values of the CEO are the values of the Company. The bribed officials to get their federal loan and the funds expended by them to get that loan are being traced back to sources. The McKinsey guys at DOE are connected on paper to Tesla in extensive conflicts of interest. The CEO put people into Zap, XP, Ecomotors, Aptera and other electric car companies to sabotage and spy on them. He spied on all of his staff with a fake email campaign. Those situations are actionable.